We will introduce “Satonoi” today as the seventh brewery out of 12. Kenji Hirakawa started his sake business in 1902 at current Toga area, Oga city in Akita prefecture. Kenji’s grandfather Tokichi established a branch family from the head family based at current Asauchi area, Noshiro city during 1818 to 1830. Family contributed to reclamation of Wakami area, Oga city with the agricultural advisor Onomatsu Watanabe, who rendered significant achievement to Akita’s water supply and reclamation work at that time by completing the difficult construction which drew water from the spring at the foot of Mt. Kanpu. Their brand name Satonoi is said to be named after the area of pure spring water in the village of Toga. They drew the water from the well and used it for sake brewing. The quality of water is said to be really great, just like their brand name. The main markets of Satonoi were northern part of Oga peninsula and the herring fishing area in Teuri and Yagishiri Island, Hokkaido. At that time, in Oga, there were people who had the right of the herring fishing place in Hokkaido and made a living based on the income from that. Through those people, the market seemed to have expanded from Oga to Hokkaido. In addition to this, the migrants from Oga peninsula also might have had a big influence on the market such as Kashichi Akiyama who moved from Oga to Yagishiri at the end of Meiji era and made a fortune by herring fishing. From this point, it seems that the sake taste of Satonoi was definitely elegant which goes well with herring dishes. Since a transportation infrastructure was not developed at that time, there is an anecdote that people carried sake on their backs and delivered them from Akita to Hokkaido. The payment for sake from herring fishermen was twice a year. During the Showa period, as the number of herring coming to Hokkaido was decreasing, herring fishing business also continued to decline. Since then, their samiannual payment was also stopped and lots of them became irrecoverable loans. Satonoi somehow overcame so hard time that they couldn’t pay their liquor tax. The picture above is the signboard of “Satonoi” which is only remainng goods at Hirakawa family. 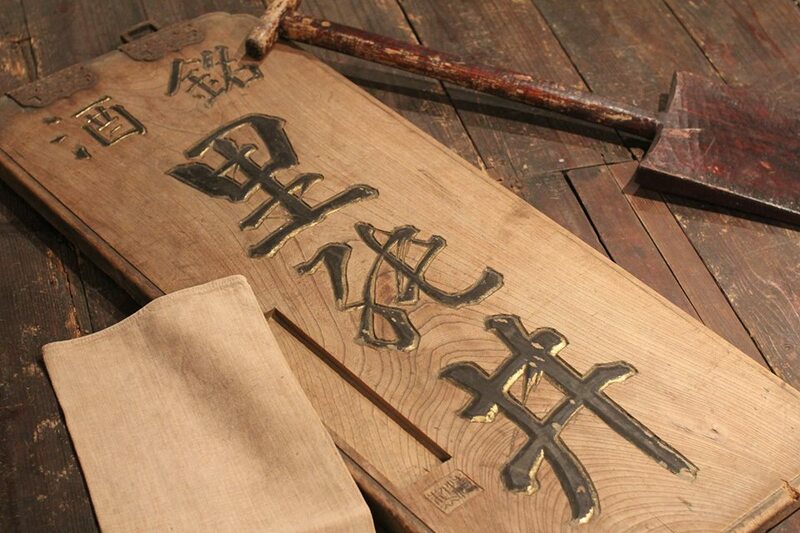 We can feel the history of Satonoi which spent turbulent period from late Meiji to Showa period.